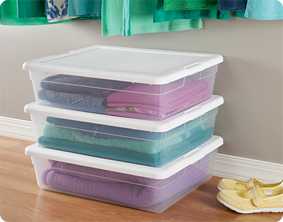 Get organized with the Clear Storage Box line! The 28 Quart Storage Box is ideal for a variety of basic household storage needs, helping to keep your living spaces neat. The clear base allows contents to be easily identified at a glance, while the opaque lid snaps firmly onto the base to keep contents contained and secure. Stack same size containers on top of each other for efficient use of vertical storage space. 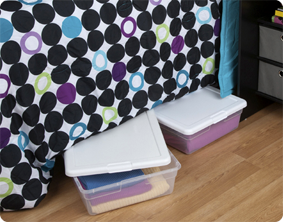 This storage box is ideal for sorting and storing towels, clothing and linens and fits conveniently underneath the bed for out of sight storage. The overall assembled dimensions for this item are 23" x 16.25" x 6". 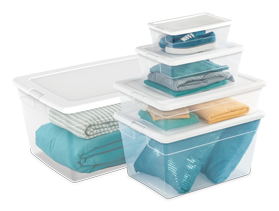 Overall Assembled Size: 23" x 16 1/4" x 6"
Maximize your storage capabilities by organizing sweaters, shoes and more beneath the bed when not in use. 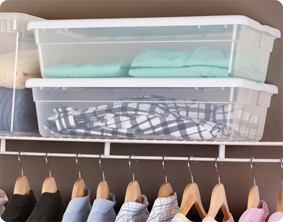 Store t-shirts, sweaters, rain coats, and more on the top shelf in a closet keeping clutter at bay. Ideal for storing clothing, scarves, mittens, or weather gear in a closet or on a shelf in a mudroom keeping them easily accessible when needed. 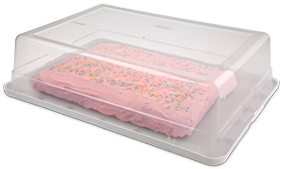 Make transporting sheet cakes a snap by turning this item upside down and placing cake on the lid and using the base as the cover. 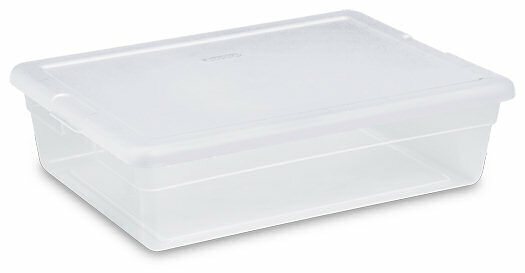 28 Quart Storage Box is rated 4.8 out of 5 by 15. Rated 5 out of 5 by jjv3 from Useful in many ways This product has helped me declutter my boys play room, my closet, bathroom, and every other inch of my house! Very durable and long lasting. Rated 4 out of 5 by withasideofhope from Perfect for Clothes I use this for storing my maternity clothing. It is perfect because it holds all of the clothing that I wore when I was pregnant. I can store it safely to use the next time I am pregnant. Rated 5 out of 5 by BeckyFlorida from Great size, very handy I LOVE these. We are 4 people and 2 home businesses in a 1 bedroom apartment and I am a bit of a neat freak and hate clutter. These make my life so much easier. I use them to organize kids' clothes, scarves, my pantry... everything. They stack nicely, are durable, and keep their contents clean. Great product! Rated 5 out of 5 by Ddtwilite from Great for Teachers to store center content! I plan on buying more of these to use for storage of my centers at school instead of hanging folders! Rated 5 out of 5 by Cal from Right size for under bed storage This is the container I use under my bed to store seasonal clothing and shoes. I also use this under the bed to store large keepsake books and items. 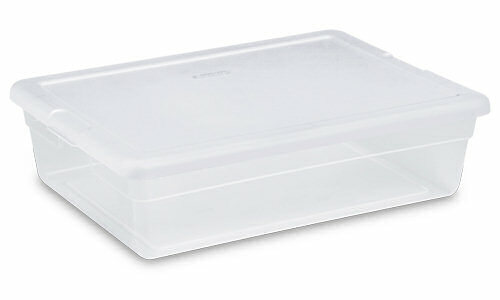 Rated 5 out of 5 by LuckyMama from 28 Quart Storage Box I love this size box fro Sterilite! In addition to being perfect under bed storage, I also use them as kittie litter pans. They are just the right size, easy to keep clean, and much cheaper than regular litter pans.